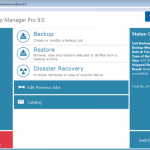 Genie Backup Manager Professional 9.0 is a total system and data protection solution that combines ease-of-use and robust performance, For businesses and individuals alike. Also Genie9 has improved the software interface. With adding new powerful features such as new Offsite Backups. Which allow you to backup to the reliable and robust cloud storage; Amazon S3, fully integrated system recovery, four backup types; Full, incremental, differential, and mirror add to that enhanced Multi-drive spanning . This Backup is most powerful Backup we have tested , A complete Backup Option with full Disaster Recovery and integrated cloud storage; Amazon S3 , and we found GBM is the best backup software that should be of great use for experts and amateurs alike. 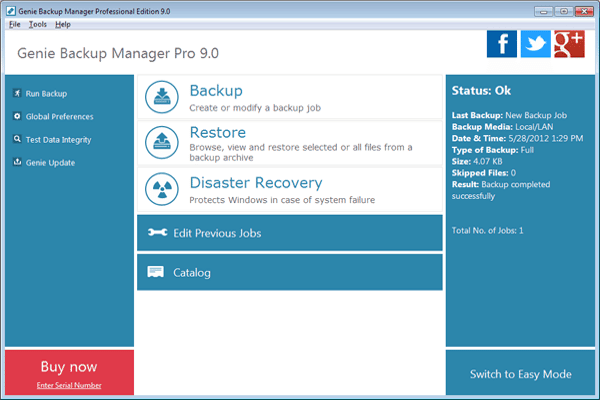 Genie Backup Manager Pro 9.0 is equipped with Windows 8 and windows 7 compatible disaster recovery (DR) features. The new version of GBM Pro 9.0 is a heavy-duty backup and restore program that performs almost any file-storage and rescue task you can imagine backing up (operating system applications, mission-critical data, e-mails, operating system and application settings, files/folders, etc) yet offering fast and easy recovery via an intuitive wizard-based interface. There is no need for Microsoft’s Windows Setup installation media. 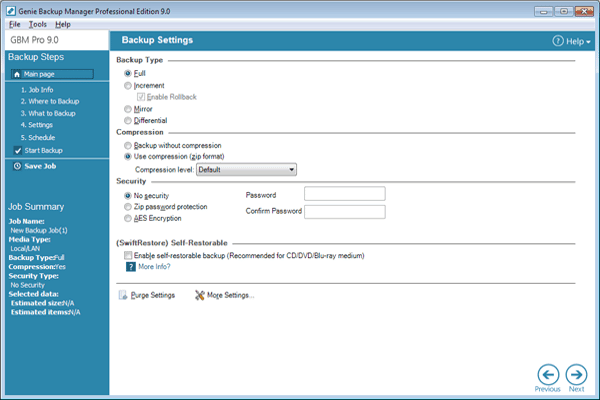 Genie Backup Manager Pro provides three different kinds of backup. One kind is a System Recovery backup, the kind in which a complete hard disk (or one or more hard disk partition) is copied to a backup location, preferably on a removable disk. The other kind is file-and-folder backup, in which you back up only selected files or folders, not an entire disk. 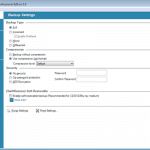 One of the other impressed feature in GBM Pro 9.0 that you can make incremental backups with rollback. Once you’ve done a full backup, you can save time and storage space by running scheduled incremental backups, which copy only files that have been newly created or altered since the last backup. In addition The rollback feature preserves earlier versions of files rather than overwriting them. With the latest version each time you run a backup, giving you a way to retrieve previous versions of documents, which you can’t do with a “normal” or “mirror” backup. 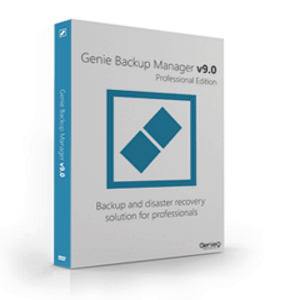 Genie Backup Manager Pro 9.0 is powerful, simple, flexible, and reliable. 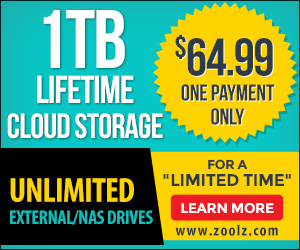 That’s all we ask for a file backup program, and we don’t think you need much more. we would have liked to have USB 4.0 support , and we would have liked a little more automated help in setting up backup destinations for multiple versions. Backup should be as straightforward and simple as possible, and GBM Pro 9.0 comes close to that ideal.